For this book, Let My Children Cook!, Hashem sent me the inspiration from a totally unexpected angle. A professional friend of mine mentioned the idea to me in a short email. I read it quickly and the idea just took off nearly immediately in my head. I sat there all that day and part of the next and just thinking about it without interruptions; that was how many of the original ideas got put down in my first outline. The best part about it – the title!! THAT ‘came to me’ almost instantaneously! Every time I see it again it makes me chuckle inside – the title was so perfect that I just had to see this book become a reality; and now, Thank G-d, it is. How did the selection of recipes differ in a children’s cookbook from the process when compiling a cookbook for adults? When I write a book for adults, I can assume that adults will enjoy and appreciate a wide variety of different and even exotic spices or herbs in their food choices, as well as many, many different kinds of vegetables…or main dishes with fancy names and cooked in wines. I also can use recipes that have several or even many steps in them and recipes that are a bit different from the usual. Kids like food that appeals to them, and that use foods with tastes they are used to. 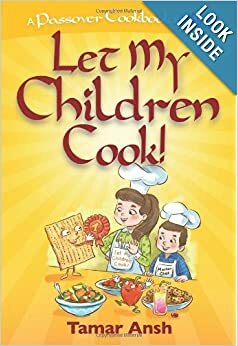 When you write a cookbook for kids that you expect them to also be able to use themselves, you need to choose ideas they can execute easily and that have less steps to them. Some recipes [in the new cookbook] are not full recipes, but more a food idea and how to prepare it and make it look nice. What’s your favorite part of Passover preparation? I’d have a hard time confining this answer to any one thing. Although it, yes, takes some energy to get started with the cleaning and organizing, once things get underway there is a very special feeling in all the preparations as we move closer to the ‘countdown’ towards Passover and Seder night. I love to see the house coming together, all the freshly laundered clothes, toys and more, the new clothing for the holiday, the arrival of all the fruits, vegetables, meats and chickens, the smell of the matzahs, setting up the Seder table…As far as the favorite part of food preparations – really , I enjoy it all. My kids love making the ice creams, special desserts, the cakes, blintzes and many other things too. I also like that part, but I let them have their fun so they do most of that now. I do the meats, chickens, fish, chrain and many other things. On Passover, we use things that are freshly squeezed or done by ourselves personally so there’s a certain camaraderie when we’re all in the kitchen and one is squeezing all the oranges so we can make ices and cakes out of them, another is busy with the lemons and a third is taking care of the chicken schnitzels while I am preparing something else. This way we all enjoy working together. We can also have guests and serve them some really tasty food, with lots of choices. On Passover for nearly every holiday meal I think we have at least two choices of dessert at each meal…and that it definitely thanks to the input of my kids! Have you tested the recipes out with kids? Which recipe has been their favorite? Yes, I certainly have. We use a large portion of the ideas in this book all year ‘round, not only on Passover. Examples are: Homemade Ice Coffee (much cheaper than the store’s! ), Milk-Less Fruit Shakes, Incredible Milkshakes, Fro-Yo Ice Pops, Blended Fruit Soup, Vanilla Ice Cream, Pastel Colored Soup, Meatballs, Crispy Chicken Cutlets, and much more. Each kid has their own favorites, and it’s more than one favorite! For sure: the Ice Coffee [RK – see page 89], the Pizza Potatoes [RK – see page 56], and the Spicy Chicken Bake [RK – see page 47]. I’d like to thank Tamar Ansh for visiting this blog! Readers — do you have any favorite books, cookbooks, or stories that make your Passover experience special? Please share them, as well as any comments on the interview, in a comment on this post.